Gradient color might be an art form. Lots people love this deep color become light gradually. Sometimes, we always paint background from deep and weight color to shallow or its reverse. The ocean also is deep blue, and as the depth become diminishing, the color of it begins to become light. That is the art work of nature base on light reflection and refraction. Now if I give you a painting brush, can you magically draw a beautiful and perfect gradient color grand spectacle? At least, I can’t complete it. But software always can finish it easily. Let’s go to the point and turn to the gradient color of flipping book background panel. 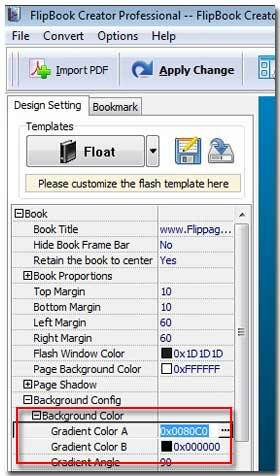 always a flipping book is placed on a panel which we always use the default from FlipBook Creator Pro, but have you ever known that in fact you can self define your own style background panel for your flipping book such as gradient color. You can optionally tone the RGB colors (Red, Green and Blue we call them three-primary-color) to your favorite ones. 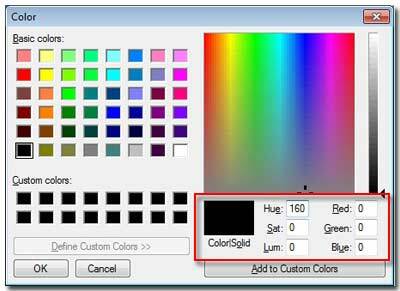 Then click button "Add to Custom Colors" to add the self-defined color to the panel for future usage. In order to make gradient effect, first you should have two extreme pole colors. FlipBook Creator Professional calls it as Gradient color A and Gradient color B, besides you also should know the angle or direction of the gradual change. These three main factors: Gradient color A, Gradient color B and Angle will create rich stunning gradient effects to make your flipping book much more attractive and looks better. 1 Select the tab "Design Setting". 2 Open the options "-Book ==> -Background Config ==> Background Color". 3 Choose color for the forms: Gradient color A and B by click button labeled "…". 4 Enter an number from 0 to 360 degrees. Finally, you must click the top button "Apply Change", if you forget, it will causes consequence very serious. All the design settings will not be saved and display on the output flipping.